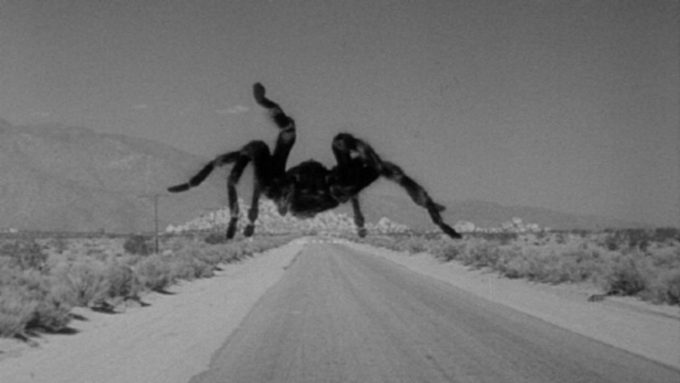 (6/10) This 1955 film marked Universal’s entrance into the giant bug market, and along with Them! it stands as one of the classiest examples of the subgenre. Sci-fi stalwarts John Agar and Mara Corday back up a good Leo G. Carroll in a rather anachronistic mad scientist role. The script is derivative and somewhat clumsy, but moves along at a good pace and avoids communist/nuclear hysteria. Occasionally flawed, but ultimately impressive visual effects make Jack Arnold’s fourth sci-fi picture a genuine classic. 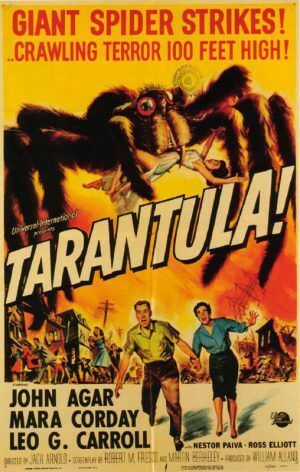 Tarantula (1955, USA). Directed by Jack Arnold. Written by Robert M. Fresco, Martin Berkeley, Jack Arnold. Starring: John Agar, Mara Corday, Leo G. Carroll, Nestor Paiva, Eddie Parker, Clint Eastwood. Produced by William Alland for Universal-International. IMDb rating: 6.5/10. Tomatometer: 92% Fresh. Metascore: N/A. (0/10) Forget Plan 9 from Outer Space, that charmingly childish fantasy from Ed Wood. Bert I. Gordon’s super-cheap directorial (solo) debut King Dinosaur is a much better contender for the title of worst film ever made. This story of four scientists battling a T.Rex on an unknown planet is inept in every single department and doesn’t even have a redeeming amateurish charm to it. The most interesting aspect of the movie is probably the life story of one of its stars, a jazz singer who kickstarted fashion guru Mr. Blackwell’s career and almost caused a diplomatic incident in Argentina. Douglas Henderson and Patti Gallagher flee a “Tyrannosaurus Rex” in a promo photo. The actual effects of the film never look this good. 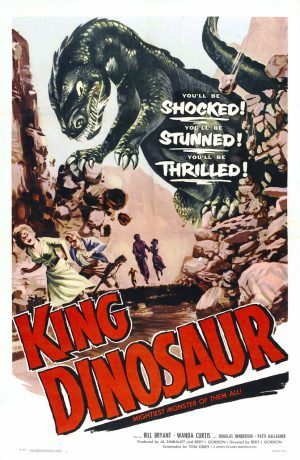 King Dinosaur (1955, USA). Directed by Bert I. Gordon. Written by Tom Gries, Bert I. Gordon, Al Zimbalist. Starring: William Bryant, Wanda Curtis, Douglas Henderson, Patti Gallagher, Marvin Miller. Produced by Bert I. Gordon for Zimgor Productions. Executive producer: Al Zimbalist. IMDb rating: 1.9/10. Tomatometer: N/A. Metascore: N/A. Note the dissimilarity between the lizard in the photograph above and the one on the poster. The poster also as five people in it. That’s more than the entire cast of the film. 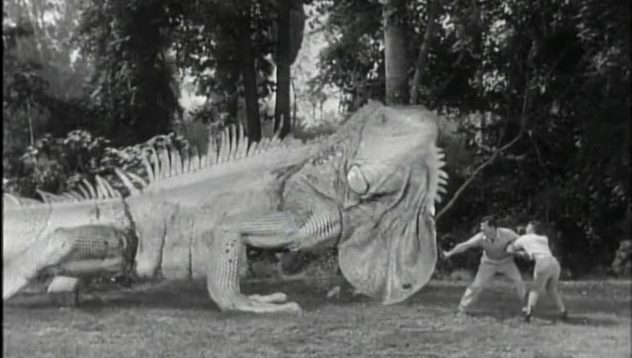 (7/10) In a nutshell: Brought to you by King Kong director Ernest B. Schoedsack, along with multiple Oscar winning teams of set designers and special effects technicians, Dr. Cyclops (1940) paints an imaginative picture of mad scientists and shrinking people in the Peruvian Jungle. Unfortunately there was no money left for actors and screenwriters. Nonetheless, this film stands as one of the best sci-fi flicks of the forties (which isn’t saying all that much, though). Charles Halton and Albert Dekker in the 1940 film Dr. Cyclops. 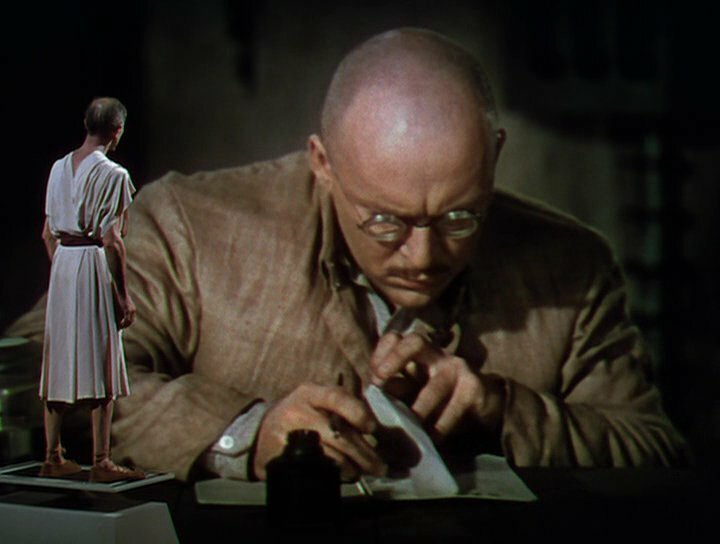 (7/10) In a nutshell: Dracula and Freaks director Tod Browning’s sci-fi/horror/comedy The Devil-Doll from 1936 is an accomplished special effects reel concerning shrunken people. Despite the feel that Browning recycles his old themes, this moral play is one of the best sci-fi films out of USA in the late thirties – and Lionel Barrymore in drag is absurdly fun. Grace Ford as the shrunken assistant Lachna in The Devil-Doll from 1936. (9/10) In a nutshell: With Bride of Frankenstein James Whale created the greatest of all Universal horror films. Superb acting, great casting, a script that balances between drama, horror and campy humour, all rounded up with fluid, expressionistic filmmaking and Soviet-styled montage editing. All this, plus the marvellous Elsa Lanchester as the Bride, Boris Karloff in high form, and a chilly, funny, scary Ernest Thesiger. Greatness abounds, but thematically the film is a bit sloppy. 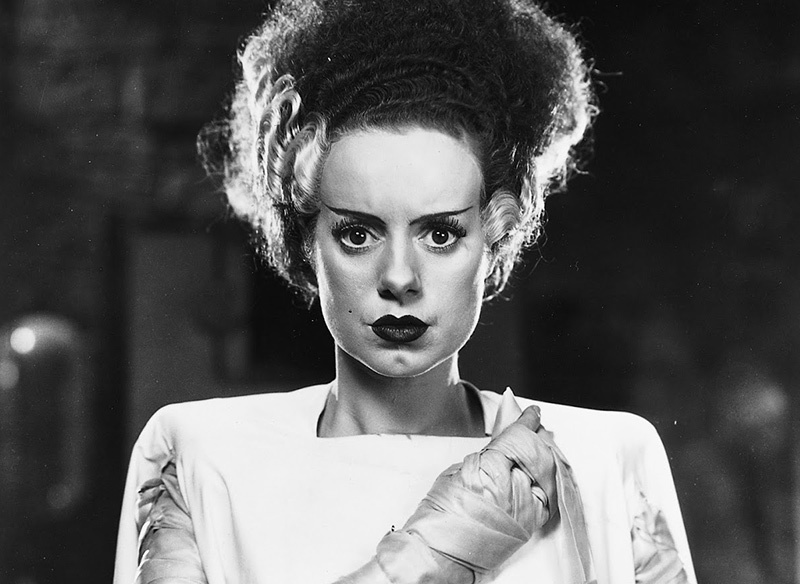 The superb Elsa Lanchester in her most iconic role as the Bride of Frankenstein.